When the Parry Auto Company moved into receivership in late 1910, its creditors reorganized as the Motor Car Manufacturing Company. For a time the Parry automobile was continued in production as the New Parry (see Parry/New Parry) but in 1912 the Pathfinder was introduced, although the company name was not changed until 1916. The Pathfinder began as a 40 hp four-cylinder automobile offered in a variety of body styles, including a lavish Martha Washington Coach style. The Pathfinder was distinguished by its appearance and bright color schemes. The Pathfinder was a good car and received a certificate of performance in 1912 by the Royal Automobile Club of England. 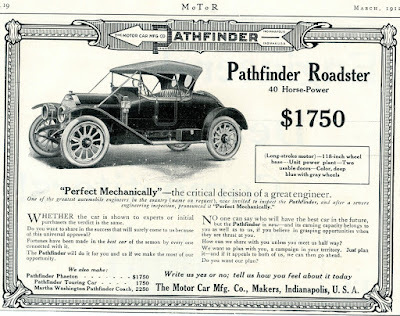 Also in 1912, a Pathfinder was driven over 10,000 miles around America without a problem and, as a result, the Pathfinder was chosen by the US Office of Public Roads and the AAA for highway survey work. A six-cylinder model was introduced for the 1914 model year and the company announced that sales were up by about 30% over the previous year and that most sales were for the six. Plans were announced for a big increase in production for 1915 and that six-cylinder cars only would be made. 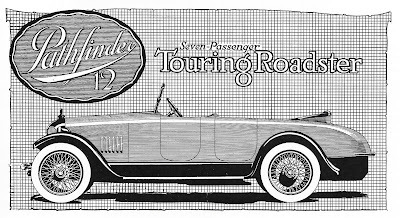 A six-cylinder Pathfinder with a curved, vee-shaped radiator appeared in 1915, including a seven-passenger Daniel Boone touring model. 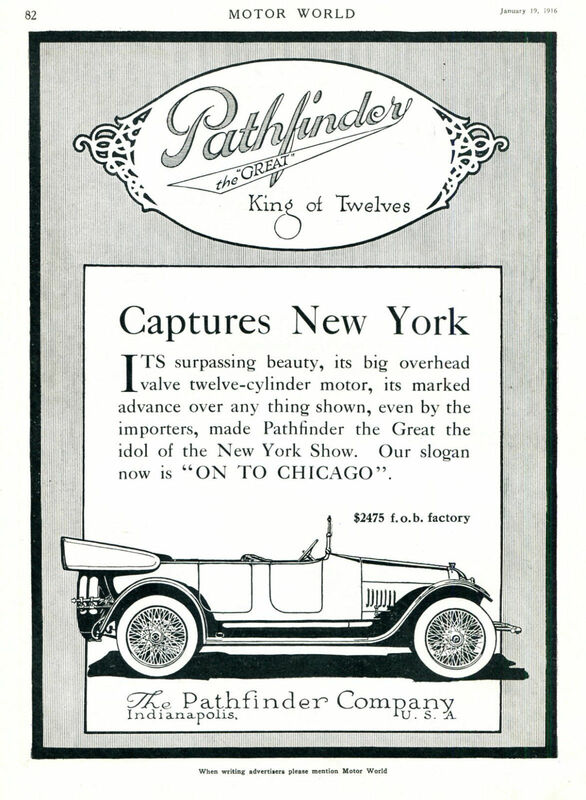 The company name was changed to the Pathfinder Automobile Company in 1916 and a model powered by a 12-cylinder engine was introduced called "Pathfinder the Great, King of the Twelves". Material shortages during the First World War caused problems and the Pathfinder was finished before the end of 1917. A 3/4-ton Pathfinder delivery van was introduced in 1913 and this was followed by a 1-ton unit, a number of which were sold overseas but they were not successful in America. Pathfinder delivery van production ceased in 1914. There was a larger version of this Pathfinder emblem, possibly as large as 260mm wide, but I cannot confirm this. I do not have a good photo of the larger Pathfinder arrow shaped radiator emblem. If you have details and a photo of this emblem, please let me know in order to update this post. 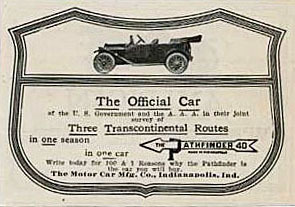 Advertisements for the Pathfinder 40 in 1913 show the arrow shaped emblem but with the words "THE PATHFINDER 40" along the arrow, see example below. I have not seen a radiator emblem with this design, but, if it does exist it would be extremely rare. 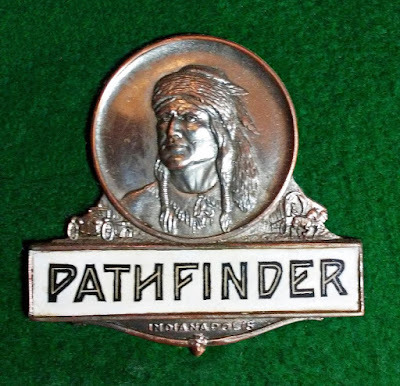 This Pathfinder radiator emblem is much sought after by collectors and is very rare. It was sometimes attached to a specially prepared mount on the radiator filler neck at the top of the radiator shell and sometimes attached to the radiator core. 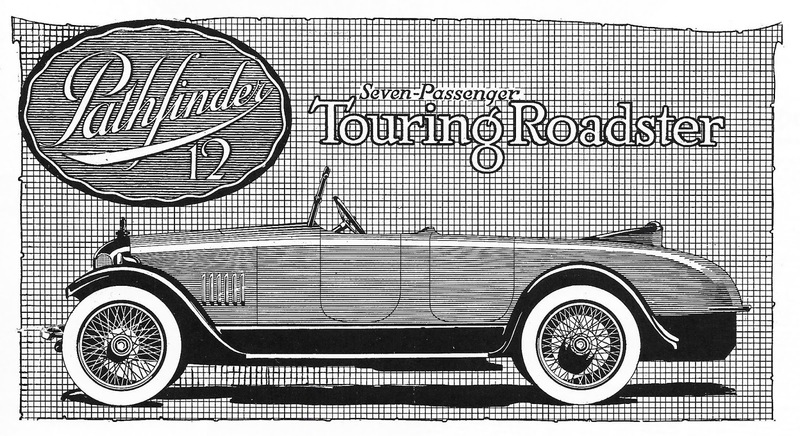 The emblem was intended for the new six-cylinder Daniel Boone model and was shown in Pathfinder advertisements in July 1913 but in the event the six-cylinder Pathfinder models did not appear until the 1915 model year, although it can be assumed that some of these models were available in late 1914. 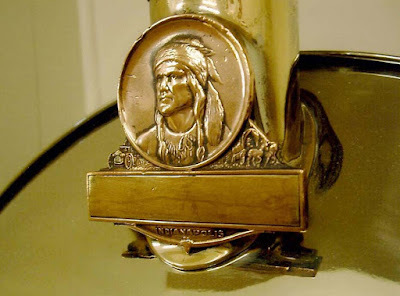 The Pathfinder Daniel Boone model was relatively short lived and was replaced in 1916, although some photos of Pathfinder cars in 1916 show this emblem still in use on other models also. The Daniel Boone radiator emblem is rather unusual. 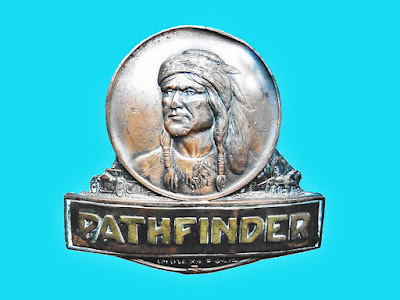 The emblem is in two pieces, the main emblem with a recessed panel at the bottom into which a separate rectangular piece with the "Pathfinder" name was attached by solder. I cannot understand why the whole emblem was not designed and made as a single piece. The only explanations I can think of are that, either there may have been some plan to insert different model names into the emblem but this did not happen, or, as will be noted later, it was planned to bend the emblem to fit the radiator curvature on some models and this might crack the enamel on the name plate. In this form, there is not enough depth remaining to insert the "Pathfinder" name panel. 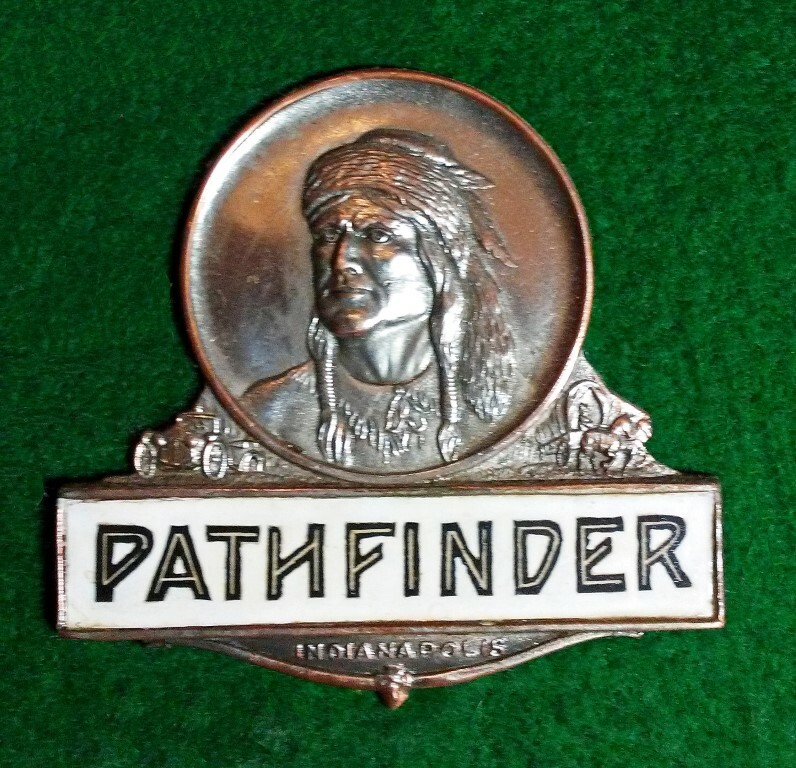 There are examples of this variation of the emblem with a varnished card displaying the "Pathfinder" name, see example below. The emblem collector and restorer, John Webster, claimed that this type of emblem was actually used on Pathfinder cars and Harry Pulfer wrote in his notes "What's in a Name" that Pathfinder was "the only emblem I know that used a paper slip to carry the name". This sounds most unlikely and I cannot confirm this. If you have any further information that would help to resolve this matter, please let me know. There is a variation of this Pathfinder radiator emblem without enamel. It has raised, plain metal letters for the word "Pathfinder" in the bottom name plate panel, see example below. The bottom of the emblem and the "Pathfinder" nameplate has been bent, presumably to fit the curvature of the radiator. 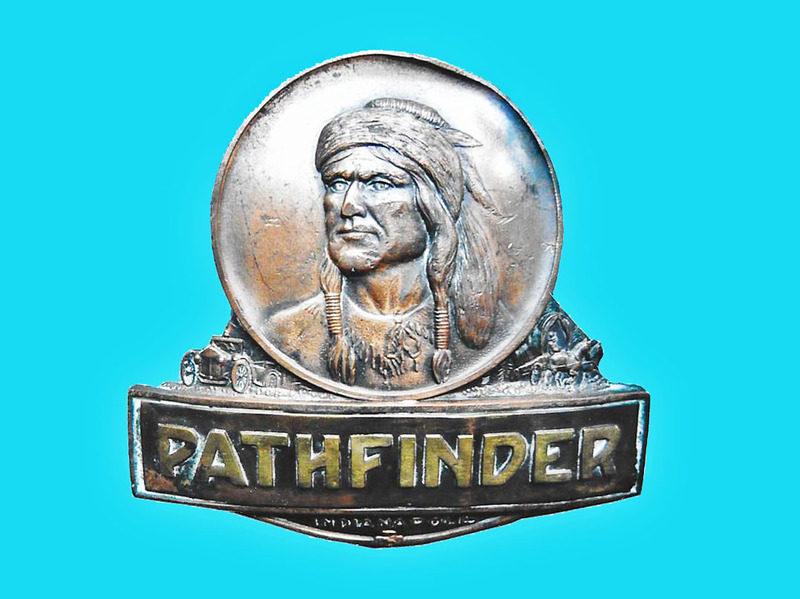 There was a different Pathfinder radiator emblem in use at about the same time as the Daniel Boone emblem and was most likely used on other Pathfinder models. This Pathfinder radiator emblem is a simple rectangular emblem very similar to the base part of the Daniel Boone emblem with the "Pathfinder" name finished in white enamel, see example below. This Pathfinder radiator emblem is rare. This Pathfinder radiator emblem shown above was attached to the radiator by being wrapped around the radiator filler neck, see original example below. The emblem shown above has since been straightened and re-enameled. As this emblem could be made to fit around the radiator filler neck without damage to the enamel, I cannot understand why the Daniel Boone Pathfinder emblem discussed earlier could not have been made as a single piece. The same emblem may have also been used flat and attached to the front of the radiator tank top but I cannot confirm this. This Pathfinder radiator emblem has also been seen finished in black and white enamel, see example below. This Pathfinder emblem must have been used flat against the radiator tank top and is very rare. The black and white enameled Pathfinder radiator emblem shown above is believed to be original but reproductions of this emblem have been seen with a flat back and no maker's mark. 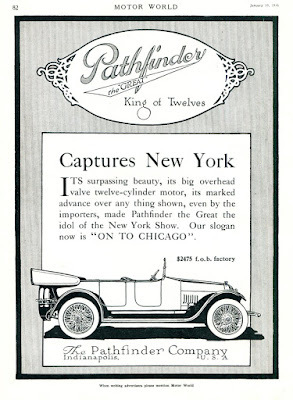 The six-cylinder Pathfinder cars built for the 1916 model year may have continued to use the radiator emblems shown above but an entirely different Pathfinder logo script appeared in advertisements for the twelve-cylinder Pathfinder cars from 1916, see example below, which suggests that the Pathfinder radiator emblem may have been changed for the twelve cylinder cars. I do not know, if any of these possible emblem designs was ever used on a Pathfinder twelve-cylinder car. If you have further details, please let me know in order to update this post. Any such Pathfinder radiator emblems would be extremely rare. The following plate uses a different form of "Pathfinder" script compared to the scripts shown above and appears to be cut from a larger plate. If you can identify where this Pathfinder plate was used, please let me know, in order to update this post.